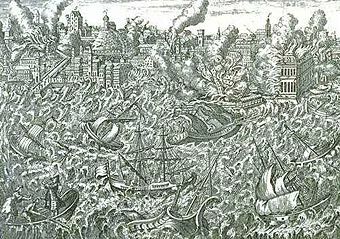 The 1755 Lisbon earthquake, also known as the Great Lisbon Earthquake, took place on November 1, 1755, at 9:40 in the morning. It was one of the most destructive and deadly earthquakes in history, killing between 60,000 and 100,000 people. The earthquake was followed by a tsunami and fire, resulting in the near-total destruction of Lisbon. The earthquake accentuated political tensions in Portugal and profoundly disrupted the country's eighteenth century colonial ambitions. The event was widely discussed by European Enlightenment philosophers, and inspired major developments in theodicy and in the philosophy of the sublime. As the first earthquake studied scientifically for its effects over a large area, it signaled the birth of modern seismology. Geologists today estimate the Lisbon earthquake approached magnitude 9 on the Richter scale, with an epicenter in the Atlantic Ocean about 200 km (120 mi) west-southwest of Cape St. Vincent. This event was one of the most important ones in modern history. It marked a separation between a naive belief in the essential goodness of God and his creation, to a fundamental questioning of the nature of God and reality. Many came to the conclusion that since God is supposed to be all-powerful, he must be capricious. This view fed a developing atheism. The earthquake struck on the morning of November 1, the Catholic holiday of All Saints' Day. Contemporary reports state that the earthquake lasted between three-and-a-half and six minutes, causing gigantic fissures five-metres (16 ft) wide to appear in the city center. Survivors rushed to the open space of the docks for safety and watched as the water receded, revealing a sea floor littered by lost cargo and old shipwrecks. Approximately forty minutes after the earthquake, an enormous tsunami engulfed the harbor and downtown, rushing up the Tagus river. It was followed by two more waves. In the areas unaffected by the tsunami, fire quickly broke out, and flames raged for five days. Lisbon was not the only Portuguese city affected by the catastrophe. Throughout the south of the country, in particular the Algarve, destruction was rampant. The shock waves of the earthquake were felt throughout Europe as far as Finland and North Africa. Tsunamis as tall as 20 meters (66 ft) swept the coast of North Africa, and struck Martinique and Barbados across the Atlantic. A three-meter (ten-foot) tsunami hit the southern English coast. Galway, on the west coast of Ireland, was also hit, resulting in the partial destruction of the "Spanish Arch." Estimated epicenter of the 1755 Lisbon earthquake. Of Lisbon's population of 275,000, as many as 90,000 were killed. Another 10,000 lost their lives in Morocco. Eighty-five percent of Lisbon's buildings were destroyed, including famous palaces and libraries, as well as most examples of Portugal's distinctive sixteenth century Manueline architecture. Several buildings that had suffered little earthquake damage were destroyed by the subsequent fire. The new Opera House, opened just six months before (under the ill-fated name Phoenix Opera), burned to the ground. The Royal Ribeira Palace, which stood just beside the Tagus river in the modern square of Terreiro do Paço, was destroyed by the earthquake and tsunami. Inside, the 70,000 volume royal library, which also housed hundreds of works of art, including paintings by Titian, Rubens, and Correggio, was lost. The royal archives disappeared, together with detailed historical records of explorations by Vasco da Gama and other early navigators. The earthquake also damaged major churches in Lisbon, namely the Lisbon Cathedral, the Basilicas of São Paulo, Santa Catarina, São Vicente de Fora, and the Misericordia Church. The Royal Hospital of All Saints (the largest public hospital at the time) in the Rossio square was consumed by fire and hundreds of patients burned to death. The tomb of national hero Nuno Álvares Pereira was also lost. 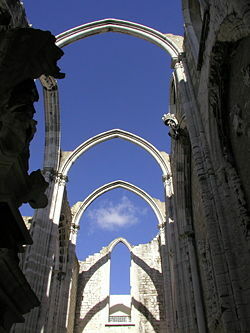 Visitors to Lisbon may still walk the ruins of the Carmo Convent, which were preserved to remind Lisboners of the destruction. It is said that many animals sensed danger and fled to higher ground before the tsunami arrived. The Lisbon quake is the first documented reporting of such a phenomenon in Europe. The Ruins of Lisbon. Survivors lived in tents on the outskirts of the city after the earthquake, as shown in this fanciful 1755 German engraving. Owing to a stroke of luck, the royal family escaped unharmed from the catastrophe. King Joseph I of Portugal and the court had left the city, after attending mass at sunrise, fulfilling the wish of one of the king's daughters to spend the holiday away from Lisbon. After the catastrophe, Joseph I developed a fear of living within walls, and the court was accommodated in a huge complex of tents and pavilions in the hills of Ajuda, then on the outskirts of Lisbon. The king's claustrophobia never waned, and it was only after Joseph's death that his daughter, Maria I of Portugal, began building the royal Ajuda Palace, which still stands on the site of the old tented camp. Like the king, the prime minister Sebastião de Melo (the Marquis of Pombal) survived the earthquake. "Now? Bury the dead and take care of the living," he is reported to have said, and with the pragmatism that characterized his coming rule, the prime minister immediately began organizing the recovery and reconstruction. He sent firefighters into the city to extinguish the flames, and ordered teams to remove the thousands of corpses before disease spread. Contrary to custom and against the wishes of representatives of the Church, many corpses were loaded onto barges and buried at sea beyond the mouth of the Tagus. To prevent disorder in the ruined city, and, in particular, as a deterrent against looting, gallows were constructed at high points around the city and at least 34 people were executed. The Portuguese Army surrounded the city to prevent the able-bodied from fleeing, so that they could be pressed into clearing the ruins. Not long after the initial crisis, the prime minister and the king quickly hired architects and engineers, and less than a year later, Lisbon was free from debris and undergoing reconstruction. The king was keen to have a new, perfectly ordained city. Big squares and rectilinear, large avenues were the mottos of the new Lisbon. At the time, somebody asked the Marquis of Pombal about the need for such wide streets. The marquis answered: "One day they will be small." The chaotic traffic of Lisbon today reflects the farsightedness of his reply. Pombaline buildings are among the first seismically-protected constructions in the world. Small wooden models were built for testing, and earthquakes were simulated by marching troops around them. Lisbon's "new" downtown, known today as the Pombaline Downtown (Baixa Pombalina), is one of the city's famed attractions. Sections of other Portuguese cities, like the Vila Real de Santo António in Algarve, were also rebuilt along Pombaline principles. The earthquake shook much more than cities and buildings. Lisbon was the capital of a devout Catholic country, with a history of investments in the church and evangelism in the colonies. Moreover, the catastrophe struck on a Catholic holiday and destroyed almost every important church. For eighteenth century theology and philosophy, this catastrophe appeared to be a manifestation of the anger of God and proved to be difficult for the religious community to explain. The earthquake strongly influenced many thinkers of the European Enlightenment. Many contemporary philosophers mentioned or alluded to the earthquake in their writings, notably Voltaire in Candide and in his Poème sur le désastre de Lisbonne (Poem on the Lisbon disaster). Voltaire's Candide attacks the notion that all is for the best in this, "the best of all possible worlds," a world closely supervised by a benevolent deity. The Lisbon disaster provided a salutary counterexample of this view. As Theodor Adorno wrote, "[t]he earthquake of Lisbon sufficed to cure Voltaire of the theodicy of Leibniz." In the later twentieth century, following Adorno, the 1755 earthquake has sometimes been compared to the Holocaust as a catastrophe so tremendous as to have a transformative impact on European culture and philosophy. Jean-Jacques Rousseau was also influenced by the devastation following the earthquake, whose severity he believed was due to too many people living within the close quarters of the city. Rousseau used the earthquake as an argument against cities, as part of his desire for a more naturalistic way of life. Werner Hamacher has claimed that the earthquake's consequences extended into the vocabulary of philosophy, making the common metaphor of firm "grounding" for philosophers' arguments shaky and uncertain: "Under the impression exerted by the Lisbon earthquake, which touched the European mind in one [of] its more sensitive epochs, the metaphor of ground and tremor completely lost their apparent innocence; they were no longer merely figures of speech." Hamacher claims that the foundational certainty of Descartes' philosophy began to shake following the Lisbon earthquake. On Portuguese internal politics, the earthquake had a decisive impact as well. The prime minister was the favorite of the king, but the aristocracy despised him as an upstart son of a country squire. (Although the Prime Minister Sebastião de Melo is known today as Marquis of Pombal, the title was only granted in 1770, fifteen years after the earthquake.) The prime minister in turn disliked the old nobles, whom he considered corrupt and incapable of practical action. Before November 1, 1755, there was a constant struggle for power and royal favor, but afterwards, the competent response of the Marquis of Pombal effectively severed the power of the old aristocratic factions. Silent opposition and resentment of King Joseph I began to rise. This would culminate in an attempted assassination of the king, and the elimination of the powerful Duke of Aveiro and the Távora family. How many aftershocks were felt? What kind of damage was caused? What happened in wells and water holes? ↑ Adorno, Negative Dialectics, p. 361. Brooks, Charles B. 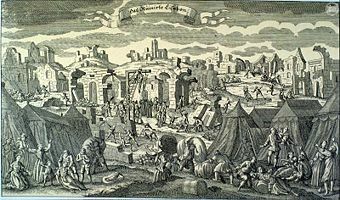 Disaster at Lisbon: The Great Earthquake of 1755. Long Beach: Shangton Longley Press, 1994. Chase, J. "The Great Earthquake At Lisbon (1755)." Colliers Magazine, 1920. Dynes, Russell Rowe. The Dialogue Between Voltaire and Rousseau on the Lisbon Earthquake: The Emergence of a Social Science View. University of Delaware, Disaster Research Center, 1999. Kendrick, T.D. The Lisbon Earthquake. Philadelphia: J. B. Lippincott, 1957. Ray, Gene. "Reading the Lisbon Earthquake: Adorno, Lyotard, and the Contemporary Sublime." Yale Journal of Criticism 17.1 (2004): 1–18. Retrieved December 14, 2007. Rev. Charles Davy: The Earthquake at Lisbon, 1755. History of "Lisbon earthquake 1755"
This page was last modified on 23 July 2018, at 21:10.